We’ve been talking a lot about how we like to bake cakes, torts, and cookies made with extra virgin olive oil. But we’ve not yet talked much about how we like to bake savory dishes, too, like bread and flatbread. Well, it’s about time we do! Matthew Kadey, a registered dietitian, recipe developer, and magazine writer whose work has appeared in EatingWell and Men’s Health, says olive oil helps to keep baked goods moist. It also plays a role in the physical sensation a baked good creates in your mouth. “It definitely contributes to moisture and mouthfeel,” says Kadey, the baking guru behind the website Muffin Tin Mania. This flatbread (featured in the photo above) would make a great appetizer during the holidays, given its festive red and green colors. 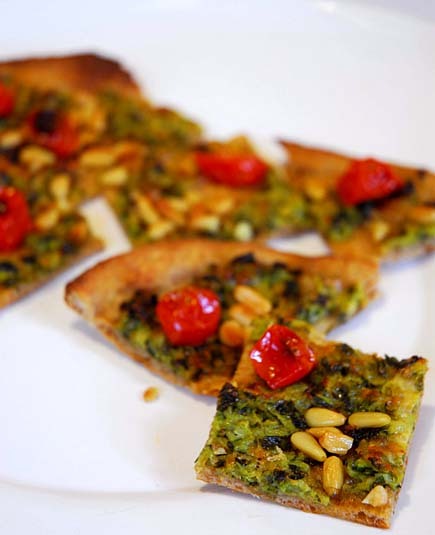 The recipe originally appeared as a zucchini flatbread in a baking book Jeff Hertzberg co-authored, Healthy Bread in Five Minutes a Day (St. Martin’s Press, 2009). This past September Hertzberg decided to make a variation on the original recipe, which also featured chopped parsley, sliced scallions and pine nuts in addition to the shredded zucchini. The addition of the roasted tomatoes, by the way, turned out to be a winning combo for the flatbread. Hertzberg’s suggestion: Serve this dish as an appetizer with a crisp dry white wine. 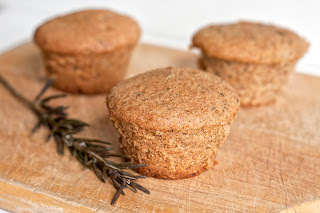 “These individual olive oil breads are very light and have just the perfect touch of rosemary,” says Kadey, who writes a food blog about his passion for cooking with muffin tins. He adds they would make a “perfect side-kick” for hearty soups or a festive holiday meal. The recipe is versatile. Kadey suggests you could substitute grated nutmeg for the chopped rosemary to give the bread an altogether new flavor.